A Thanksgiving Gift Basket for Dogs while you are enjoying your Thanksgiving dinner - why not!! Let your pet join in with some of the finest dog treats we have to offer! These Dog Thanksgiving Gift Baskets for Fall & Thanksgiving are sure to get their tails waggin' because we have only included the "best of the best" for those faithful companions. included with all of our Dog Thanksgiving Gift Baskets! 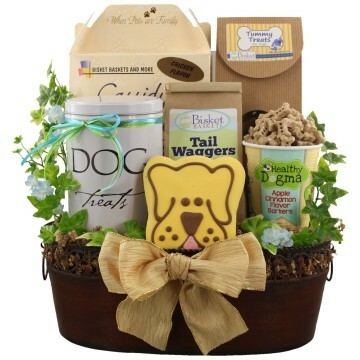 Sophisticated Dog Gift BasketGet their tails a waggin’ with this outstanding and sophisticated dog gift. Desired by both corporations to families, this gift is suitable for the movie star dog to the dog next door. An excellent choice in high end sophistication and beyond. Artfully designed to include an assortment of gourmet dog treats to our very own bake at home mix that every dog devours.